Thanksgiving Day is a harvest festival, mainly celebrated in the United States and Canada. In the United States, it falls on the 4th Thursday in November, but in Canada. it falls on the 2nd Monday of October. The game of bingo is an interesting idea to mark this holiday. The game is played in exactly the same way the standard version of bingo, except that instead of using standard bingo cards containing numbers, the game is adapted for the holiday by playing using custom bingo cards printed with words or phrases that relate to the holiday. If you want to organise a game of Thanksgiving bingo, the key requirement will be obtaining some bingo cards printed with the words or phrases relating to the Thanksgiving theme. While it may be possible purchase ready-printed bingo cards but that could be expensive and you could find that such bingo cards do not contain the exact items you want anyway. My suggestion is to print-out the cards yourself, using your computer. This process is actually amazingly straightforward - You simply need to download some bingo card maker software, and you can print out your customized bingo materials with no more than a few minutes work. 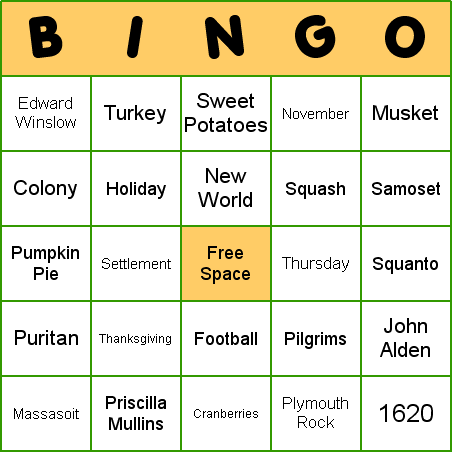 Finally, one last thing that should be made clear is that Thanksgiving bingo can also be played foreign language (for example French, German, and Spanish) and ESL/EFL (English as a Second/Foreign Language) class. Not only because it is extremely entertaining, but also can be highly educational - by simply being a classroom activity that helps practise the language.